Diesel engines may have suffered a setback in passenger cars over the past couple of years, but their torque and economy makes them perfect for pickups like the 2018 Ford F-150 Power Stroke Diesel. Ford’s plans to put a diesel under the hood of America’s best-selling vehicle were announced some time ago, but now we’re finding out just how frugal it can be. Here’s what you need to know. Ford’s drivetrain for the 2018 F-150 Power Stroke Diesel is fairly special. Under the hood is a 3.0-liter engine, combined with a 10-speed SelectShift automatic transmission. It delivers a hefty 250 horsepower at 3,250 rpm and 440 lb-ft. of torque at 1,750 rpm. Fleet customers will be able to order the 2018 F-150 Power Stroke Diesel in Ford’s XL and XLT trims. However the retail versions of the truck will only be offered in Limited, King Ranch, and Lariat trims. Expect to pay a premium of a few thousand dollars over a gas engine, too. 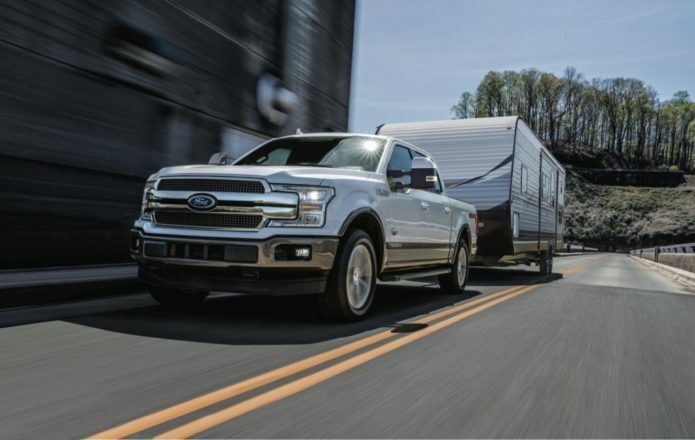 Pickup drivers love knowing their trucks can handle heavy towing loads, and the 2018 F-150 diesel certainly delivers there. Indeed, it has a best-in-class diesel towing rating of 11,400 pounds. That puts it roughly on a par with the 5.0-liter V8, with its 11,600 pound towing capacity, and comfortably outperforms the 2.7-liter EcoBoost with its 9,000 pounds. As for payload, that comes in at up to 2,020 pounds for the diesel F-150 configured for fleet customers. That’s actually fairly low for the line-up: it only beats the entry-level 3.3-liter V6, which manages 1,990 pounds, but every other F-150 engine can handle more. Even so, it’s still enough to be best-in-class, Ford says. Retail customers will get a 1,940 pound version. The big question we had when Ford announced the 2018 F-150 Power Stroke Diesel was just how frugal it would be. With the EPA figures released today, now we know. It’s rated for 30 mpg on the highway, 22 mpg in the city, and 25 mpg combined. “These are the highest EPA-estimated ratings available in a full-size pickup truck,” Ford points out, and they also put the rest of Ford’s F-150 line-up into the shade. The next most frugal model is the F-150 2.7-liter EcoBoost, in fact. That manages 26 mpg on the highway, 20 mpg in the city, and 22 mpg combined. Notably, the diesel’s maximum torque comes in at much lower engine speeds than the EcoBoost’s does. While the F-150 diesel’s EPA figures are impressive, it’s worth noting that they’re only for the front-wheel drive version of the pickup. If you want the four wheel drive model, that comes with a compromise in economy. Expect to get 25 mpg on the highway, 20 mpg in the city ,and 22 mpg combined. That puts it far closer to the gas-engined F-150 models and, indeed, the rest of the pickup landscape. Right now, the diesel F-150 is the most efficient of the Ford full-sized pickups. That may not be the case forever, though. Ford is also readying a hybrid F-150, with an as-yet-unspecified drivetrain that will deliver the low-end torque of an EV but with the towing capabilities we’d associated with a more traditional, ICE engine. Still, there’ll be competition from elsewhere in the segment, too. The 2018 Ram 1500 EcoDiesel is on the horizon, with its EPA rating coming in at 20 mpg in the city, 27 mpg on the highway, and 23 mpg combined for the rear-wheel drive version. The four-wheel drive model gets one point lower on its city and combined figures.